This summer I had the pleasure of working with a group of seven interns and four mentors on Eleuthera Island, Bahamas and at the University of Minnesota Twin Cities and Duluth. For two weeks at the beginning of June, we cored three Bahamian lakes, two being blue holes and the other a coastal pond. 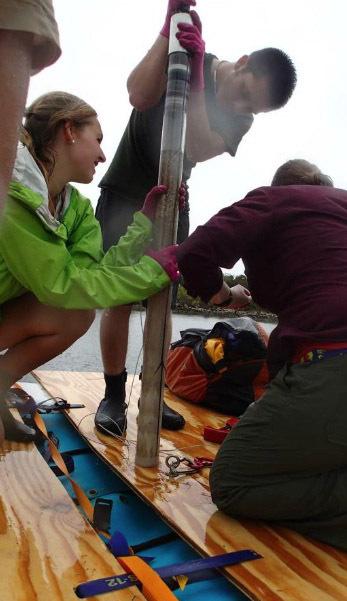 The goal of this Research Experience for Undergraduates (REU) was to determine the anthropogenic changes that took place in the past thousands of years in the Bahamas by using proxy data from these lakes. The project was led by a Wooster graduate, Dr. Lisa Park Boush (’88), who like myself, was one of Dr. Mark Wilson’s advisees. One of the other mentors, Kristina Brady, also graduated from Wooster (2003) as Dr. Wiles’ advisee, and is now working at LacCore at the University of Minnesota as a curator. My team worked on the first blue hole, which we named Duck Pond Blue Hole. Duck Pond Blue Hole is an inland circular body of brackish water located in the southern tip of Eleuthera Island. We hypothesize that there are underground conduits connecting the blue hole to the ocean due to the salinity and the fact that the water level was affected by tides. Cores were taken with hand-operated corers from three different spots along a transect of the lake. Overall, my team recovered over four meters of sediment from the three sites! We also took bathymetry data, depth profiles, and did a vegetation survey around the perimeter of Duck Pond Blue Hole. 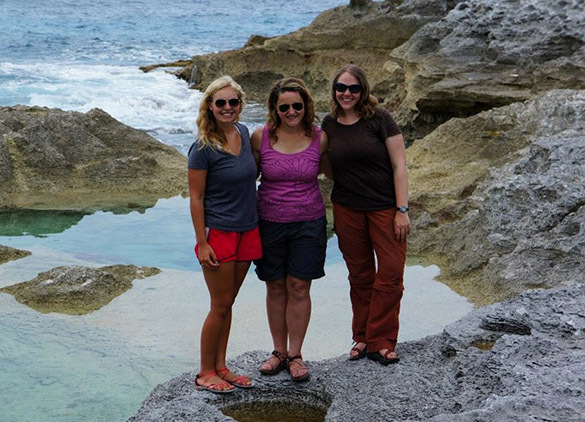 Myself, a teammate, and Kristina Brady (’03) capping a core from Duck Pond Blue Hole. Check out our mighty coring vessel! The other team of interns worked on a coastal pond, located directly behind one of the most beautiful beaches in the world. They cored the pond at three sites and took similar lake profiling data as my team. They also worked on dune profiles with Dr. Ilya Buynevich from Temple University using his GPR machine. 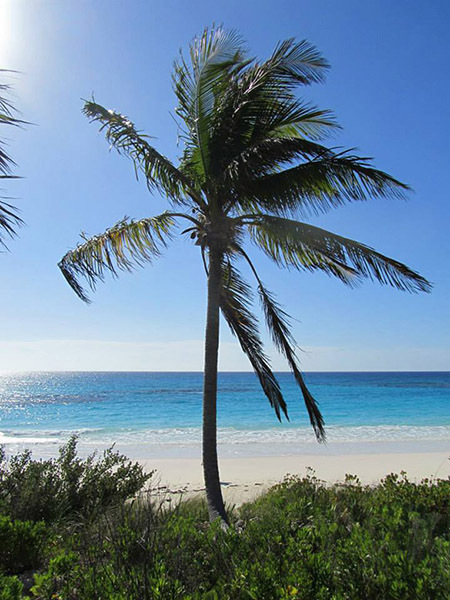 The rest of the time on Eleuthera was spent exploring the island and learning about its history. We took two day-long field trips in which we saw many geological features as well as archaeological sites. With the help of Dr. Perry Gnivecki and Dr. Mary Jane Berman, both from Miami University, we learned all about the native inhabitants of the Bahamas, the Lucayans. We hope our project will help them understand how they were affected by climate change and the landing of Columbus in 1492. 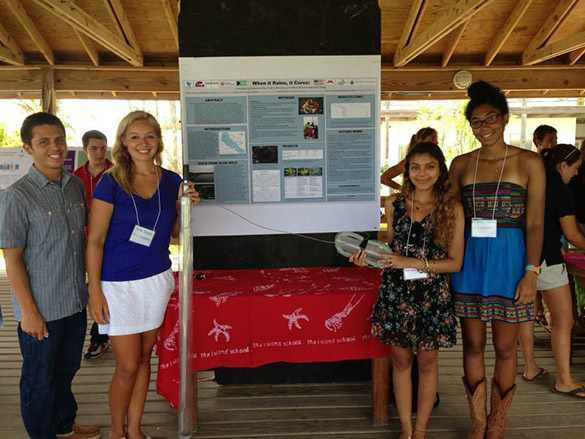 Finally, we got to present our preliminary results to the people of the Bahamas at the Cape Eleuthera Institute. My teammates and I presenting Duck Pond Blue Hole at CEI. After finishing fieldwork, we headed to LacCore, the National Lacustrine Core Repository, at the University of Minnesota in Minneapolis to analyze our data. We logged, split, photographed, and described our cores first. We also did a variety of lab work with core samples such as, carbon-14 dating, SEM, loss on ignition, making smear slides, and shell counts. We also got to work at the Large Lakes Observatory in Duluth, Minnesota using the XRF machine and doing grain size analysis. Myself and a teammate prepping samples for grain size analysis at the Large Lakes Observatory in Duluth. 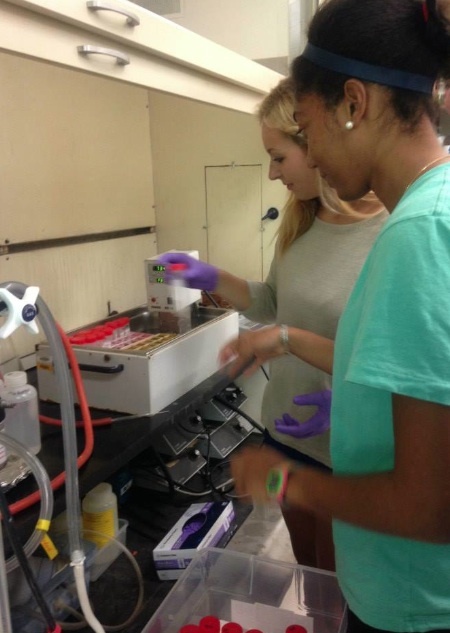 This lab work took about six weeks to complete and we got some amazing results from it. We used the last few days in Minnesota to write our abstracts and make posters for upcoming conferences. Each person took one aspect of our project to focus on. My abstract and poster focuses on the mollusk communities of Duck Pond Blue Hole and how they may be an indicator for climate and sea level change in the Bahamas over the past 6,000 years. In order to discover what we found, you will have to visit my teammates at GSA in Denver in October or AGU in San Francisco in December. I hope to be able to make it to the AGU conference to help present my team’s work, however, I won’t be presenting my individual abstract until the spring at a regional GSA meeting. If you want to read more on the project, check out the REU Bahamas page on Facebook or the daily blog we kept throughout the project. Now, it’s off to Byron Bay, Australia, for me! I hope everyone had a great summer and I wish you all a successful fall semester!